27/04/2018 – Is digital Construction Helping Foster Better Working Relationships Amongst the Industry? NBS released its fourth Contracts and Law report last week, shedding light on how well the industry is getting along. The report comes at a time when the industry is dealing with the Brexit fallout, the Grenfell tragedy and heightened concerns about the viability of some Tier 1 contractors. As Building Information Modelling (BIM) increasingly becomes business as usual for most practices, the design community in particular looks well placed to lead and capitalise on the digital disruption the industry is experiencing, posing the question of whether current legal and contracting practice is exposing everyone involved in projects to unacceptable risks. Collaboration has long been a goal for the industry, with BIM and the Government’s Construction Strategy giving it a renewed focus and it’s clear that the industry does see the advantage of collaboration to enable information sharing, reduce the number of disputes and improve the delivery of the client’s objectives. Over two thirds of respondents adopt collaborative techniques on all or most projects and just under half of respondents (45%) feel that collaborative projects are helped by the adoption of BIM. The majority of respondents agree that their organisation sees BIM as contractually binding in the same way as specifications or drawings, but the report details a number of cases where the ownership of the building information model has been an issue of dispute. There is a risk of collaboration falling apart at the first hurdle if that collaboration is not clearly described in contracts. Who is responsible for what and when, and with whom do they collaborate needs to be defined as without this, a collaborative relationship can quickly become an adversarial one – tools like the NBS BIM Toolkit and the RIBA Plan of Works come into play here. BIM is an example of collaborative, information rich, design practice. Future technologies are likely to be even more collaborative and even more information rich and as we move to the yet-to-be-defined BIM level 3 and the implementation of future technology, creating a legal framework that describes BIM is a necessary foundation. Disputes are still very common and are regarded by some as a part of doing business in the UK construction sector. Of the disputes that respondents reported, fewer than half were settled. However, fewer people commented that the number of disputes is increasing, and fewer people said that they were involved in disputes suggesting that the direction of travel is good. NBS is committed to gathering, structuring, standardising and making available the highest quality building and product information required for successful design and construction. Getting the information right not only improves client outcomes and increases the efficiency of projects, it also reduces professional risk, allowing a tight description of what is to be built, so reducing the scope for dispute. http://cene.org.uk/wp-content/uploads/2014/10/Web-Logo-300x137.png 0 0 Leanne Conaway http://cene.org.uk/wp-content/uploads/2014/10/Web-Logo-300x137.png Leanne Conaway2018-04-27 10:00:432018-04-26 07:47:3827/04/2018 - Is digital Construction Helping Foster Better Working Relationships Amongst the Industry? Will an architect be in breach of his duty of care if his design fails to take into account the client’s budget? This point was considered by the Technology and Construction Court (TCC) in the case of Riva Properties Limited v Foster + Partners (2017 EWHC 2574). A duty of care is there to ensure that another party does not suffer unreasonable harm or loss that can arise as a result of contractual obligations or tort of negligence. The first thing to consider is whether a duty is owed. The architect has a duty of care to provide adequate professional, financial and technical resources, and a duty to inform the client about progress and any issues that may affect the brief, construction cost, programme or quality. Riva Properties Limited (Riva) engaged Foster + Partners Limited (Foster) in 2007 to design a 5-star hotel near Heathrow Airport. Fosters’ appointment did not include a budget figure, but Riva claimed to have mentioned a figure of £70m at the beginning of the scheme. Foster produced a design that was originally costed at £195m, but later reduced assuring Riva that the project could be “value engineered” down to £100m. Acting upon that assurance, Riva proceeded with the scheme, which turned out to be unachievable on the £100m figure. Riva lodged a claim against Foster for substantial lost profits of the hotel complex, which consequently was not built and wasted expenditure. Foster denied that it had ever been informed of a budget for the project. The Court found that Foster was, in fact, aware of the initial budget figure, but even if he had not been told the figure, he should have made the relevant enquiries to find out what the budget was at an early stage, and rightly so. The Court further said that Foster had acted negligently when he advised that the project could be reduced in value to bring it within Riva’s budget. Given that Foster knew that Riva expected the cost reduction to be achieved by value engineering, Foster was under an obligation to advise Riva that it was impossible. As a result, Foster was ordered to repay professional fees charged of £3.6m. The Court’s decision makes it clear that an architect must undertake its design work in accordance with the client’s brief. Cost and budget is a key constraint and should always be identified and considered when designing a project, even if the architect is not expressly required to provide cost advice. Although the facts relate solely to the provision of architectural services, the case serves as a sharp reminder to all industry professionals of the importance of performing professional services by reference to the client’s objectives and budget requirements. Where a budget has been set, a frequent review of the viability of the scheme against the budget should always be carried out. As Foster found out, failure to do so can painfully hit the pocket. Sweden, like its neighbour Norway, is poised for a sea change in the way it provides community sport and leisure facilities. As a member of the International Association for Sports and Leisure Facilities (IAKS) and a renowned innovator in the design of community sports facilities, our practice was invited to speak at the Träffpunkt Idrott Sports Summit in Gothenburg, Sweden to share our latest thinking in this area. Taking place over three days the summit covered a wide range of topics around the agenda of public health, sport and exercise. I spoke in a seminar moderated by Dr. Karin Book from Malmö University, which interrogated the latest trends and innovations in the design of sport facilities, and in particular, the ability of sports architecture to promote public participation and active lifestyles. The value of sport and physical activity to local governments and communities extends beyond sport for sport’s sake. In its widest sense, sport can deliver a positive impact on individuals, communities and wider society, generating a range of socio-economic benefits including a positive impact on public health and wellbeing. Moving the public away from inactivity towards movement of any kind, has been an ambition of policymakers for some time, in the UK and worldwide. Featuring speakers from two different practices and backgrounds, the conversation covered a range of experiences in the design and delivery of sports facilities. Flemming Anders Overgaard, a co-founder of Copenhagen practice Keingart, shared his understanding of modern active lifestyle and the demands placed on facilities promoting sport and physical activity. Using examples of projects delivered by his practice, he demonstrated the value of small interventions in the promotion of not only programmed exercise, but also spontaneous movement, capable of engaging wider groups of users in physical activity. My talk on the other hand, explored how innovative design solutions can contribute to an improved user experience, promote inclusivity, and foster public engagement in sport and leisure facilities, all with the outcome of increased participation. I used the rich experience of our practice in delivering multipurpose and multi-functional sports buildings to demonstrate how design for the ‘movement continuum’ is able to widen outreach. This concept looks at collocating a whole spectrum of sporting activities under one roof, thereby inviting a wide range of users of different ages, gender, physical capability and motivations to participate. This creates opportunities for a range of activities, starting from leisure and entertainment, requiring very little skill and commitment but able to gently introduce people into sports, to more formal sport and fitness activities, all the way to performance level sports. In addition, I explored the synthesis between sport and educational facilities and the ability of collocation of these two potentially polarized functions to attract more people into the building, and ultimately, to motivate visitors to engage with a sporting offer. Building on our experience of four major projects at different stages of delivery, I illustrated how transparency and visibility of the sporting offer, as well as the positioning of social spaces in relation to the entrance and core activities can help to achieve this. 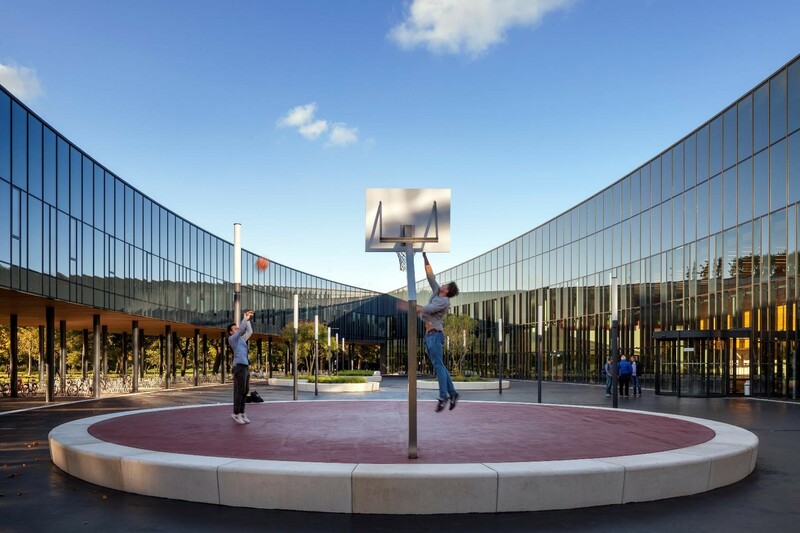 All the discussed architectural principles fall under an overarching concept of active design which looks at promoting spontaneous movement, active lifestyles and physical activity. This has become an important item on government agendas across Europe, in an attempt to tackle issues surrounding public health, wellbeing and inactivity. Whilst highlighting obvious benefits of active design principles, this conference revealed a lack of supporting evidence at a practical level. This spiked a conversation around the cost implications of conducting research and the required involvement of specialist consultants to push this aspiration forward. The debate has also emphasized the necessity to promote active design principles to clients and developers, creating opportunities to trial emerging concepts further. Ultimately, we believe strongly in the positive role active design can play in not only the design of sports facilities, but many other building typologies, and we will continue to encourage a joined up approach to its development across the industry. Last week, the 4 April deadline passed, and all eligible companies should have reported their gender pay gap. The results, perhaps unsurprisingly, show that the construction sector has the biggest gender pay gap of any UK industry, at 25%. We have known of the under-representation of women in the industry for many years, so this is nothing new but hopefully the publicity around the results will prioritise the issue in boardrooms and kickstart actions. It must be stressed that the gender pay gap reported is not about the salaries people are paid or ‘equal pay for equal work’. The issue highlighted is the number of women in organisations and the levels at which they are employed. Construction needs more women at all levels, from the boardroom to trades on site. Companies need to consider the cultures within their organisations and how they recruit, retain and promote people. Do their current policies and procedures allow unconscious bias to influence who are given opportunities? Are there senior female role models in the organisation for women to aspire to? Do they value difference and celebrate diversity of people, ideas and management styles? The pay gap data is supported by numerous other surveys, including a recent Randstad report which highlighted 75% of industry employees passed over for a more senior role were women. Women were also three times more likely to miss out on promotion in the industry and 49% of those questioned had never worked with a female manager. None of which is a surprise. Following the report, many of the leading employers have announced that they are actively seeking to recruit more women into senior roles. Kier aims to establish a 70:30 male-female gender split at graduate level and Balfour Beatty has a three-year plan involving mentoring and unconscious bias programmes to encourage more women to join and seek career progression. On 25 April CENE are hosting an Introductory Workshop on Fairness, Inclusion and Respect in Construction. The event is free to attend and will enable attendees to discuss ideas and initiatives to support their workforce and realise the business benefits. Inclusion is about making everyone feel that they are a key part of the organisation. Ensuring people feel included within teams is especially important within the industry, where future successes depend on working well together. The UK has a set legal framework with the following definition: “An equal society recognises the diverse needs, situations and goals of individuals. It removes discrimination and prejudice, and tackles the economic, political, legal, social and physical barriers that limit what people can do and be.” (Equalities Review 2007) Which in the workplace this means employers must, treat all employees and prospective employees fairly and considerately and protect all employees from discrimination. Everyone has a role to play in promoting Fairness, Inclusion and Respect (FIR) in construction, in the same way that everyone is responsible for maintaining health and safety measures. We take health and safety extremely seriously, and it should be no different when it comes to FIR. Position their business at the forefront of driving a genuinely collaborative sector wide initiative to improve our industry. The FIR programme comes at the perfect time, as the results of the requirement to disclose gender pay gap information slowly start to emerge. As of March, construction was the sector with the largest gender pay gap, with data showing employers pay women, on average, 21% less than men. The information doesn’t go into detail yet about job roles and responsibility but from an outsider’s point of view, it doesn’t look good and this is what we need to address. To be anywhere near reaching the targets set by Construction 2025, we need to be encouraging the entire talent pool and not excluding potential candidates, for any reason. We need all available talent regardless of gender, age, ethnicity, values, experience etc. As a sector, we need to embrace FIR in order to attract, recruit, train and retain the skills and talent that we need to deliver our pipeline of works. CENE are hosting a free event with DAC Beachcroft, looking at FIR why it’s important to your future business success. As well as this free Introduction to FIR Workshop, the FIR Programme includes the FIR Online Toolkit with e-learning modules and toolbox talks, resource library, case studies and trainer’s guides, and the FIR Ambassadors Network – everything you could possibly need to run a fair, inclusive and respectful business and reap the benefits.